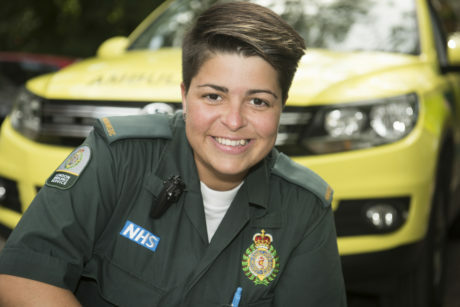 After Paramedics saved her life when she was involved in a motorcycle accident, Priscilla was determined to become a Paramedic in London. She’s worked for us since 2014 and her most memorable moment so far was delivering a baby in the rain. I have always wanted to help people and to work in a challenging environment, so for me it was a no brainer – I simply had to apply for a job here. In 2010 my motorcycle collided with a car in Bloomsbury and I was taken to a major trauma centre. The crews that attended that day saved my life, and the experience made me even more determined to become a Service paramedic. I joined the Service in 2014, after completing a three year foundation degree in Paramedic Science at St George’s University of London in Tooting. The Service provides mentoring for students so throughout my time studying I worked alongside ambulance crews as they responded to patients. After I finished my course, I had an interview and then was offered the job. I live in east London and I asked to be assigned to a station near to where I live. Whipps Cross is also a really busy area, so it is a great place to learn and develop your skills. In my role, I respond on my own as a Fast Response Unit (FRU). This means I respond to the most serious incidents. However, the work can vary – sometimes incidents can be less serious than they were originally given to our call handlers or more serious. My most memorable moment working here was attending a call where a woman was about to give birth on the side of the road. The station had that day received brand new vehicles, but I had no choice but to put the woman onto the passenger seat and deliver her baby – I’ll never forget delivering that baby in the rain. In my opinion, it’s my dedication to my patients that makes the most difference to them. My patients always have my undivided attention. To me this isn’t a job, it’s my life. You need compassion, empathy and to be a real people person to deal with the patients from all over the world that we help on a daily basis.